Keeping the kitchen clean is a never ending job, but if you have allergies, the need to combat potential allergens makes kitchen cleanliness an even higher priority. Allergy free cleaners for household use can help control your allergies. Get down close and really look at your kitchen counter, or nose up to those shelf corners and give a good sniff or a finger wipe, and you might be disgusted with what you find. But it’s the seemingly invisible dust, particulates, pet dander, molds and mildews that are the greatest dangers to people with allergies. Even germs and stickiness can build up quickly, yet many traditional household cleaners can be risky for people with chemical sensitivities. You don’t have to live in fear of your household cleaners failing on the job or actually making you sick from the chemicals they contain. There are intelligent ways to clean your kitchen clean and allergy free. 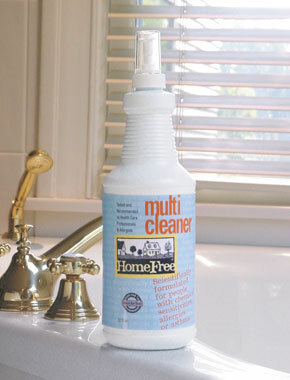 The entire line of HomeFree Cleaning Supplies is specially formulated for people with chemical sensitivities, allergies and asthma. For effective, chemically safe daily cleanup the 100% biodegradable HomeFree Multi Cleaner is entirely plant based and environmentally friendly. While this cleaner is extremely powerful, getting rid of dust, dirt, grime and “kitchen leftovers” with simple spray and wipe ease, it does not contain caustics, acids or solvents that can hurt your skin or irritate eczema. It is safe for use on any surface and will not harm fine paint finishes. HomeFree Glass Cleaner is designed for the subtle task of getting class clean and clear, and, like HomeFree MultiCleaner, does an incredible job of getting your windows and glass, or other shiny surfaces clean without harmful chemicals. 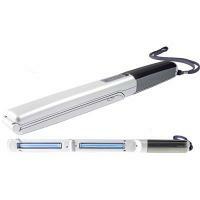 People who dislike the thought of germs around the kitchen can put their minds at ease with Handheld UV Sanitizers. The CleanWave UV-C Sanitizing Wand kills 99.9% of the germs hiding invisibly around your kitchen. The hand held UV light wand knocks out bacteria and mold, kills e.Coli bacteria, MRSA, Influenza A (H1N1), and every other kind of microscopic bug that might be hiding around your kitchen. The Nano UV Water Disinfection and Surface Sanitizer can literally disinfect water or a kitchen surface with the safe, yet intense and directed, power of ultraviolet light. This handheld wonder kills germs on the surface of your counters or appliances in 10 seconds. You can even scan water for 40 seconds to remove harmful germs. When you’re done cleaning the kitchen of germs and allergens like mold or mildew, bacteria or cold viruses, you can head up to the bedroom and get rid of dust mites and bed bugs. Like it or not, the kitchen tends to be a gathering place for both people and pets. That’s not always a good mix for people with allergies. 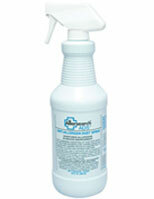 Allersearch ADS Anti-Allergen spray stops allergens from creating allergic responses. You spray Allersearch on the surface you want to treat and leave it for 3 hours. When it dries, just vacuum the area you want to clean and up comes the dust and allergens you want to remove. Apply it to kitchen carpets where dust and dirt can accumulate. And if you want to specifically deal with pet dander use Allersearch ADMS Anti-Allergen Spray, another non-staining formula that picks up pet dander also as well as allergens due to dust mites, pollens, mold and mildew. There you go! You’re healthily armed with products and techniques to make your kitchen clean and allergy free.